Yes, 49 years ago on that night you would have heard - or maybe you DID hear! – Country Joe & the Fish, Santana, John Sebastian, Canned Heat, Mountain, Credence Clearwater Revival, The Grateful Dead, , Jefferson Airplane – whoa! Come hear music of the period plus Linda’s terrific original music while surrounded by the artwork of the period, the psychedelic sixties! 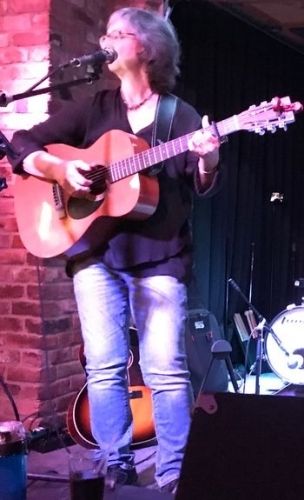 Linda Sussman’ musical influences include Joni Mitchell, Joan Baez, Leonard Cohen, Bob Dylan, Tom Paxton, and Holly Near and she has performed across Long Island and places like Kennys Castaways and the Bitter End in NYC. Check our her website HERE. Come on down, 6:30-8:30, Thursday August 16, Woodstock 49 at the Bahr!